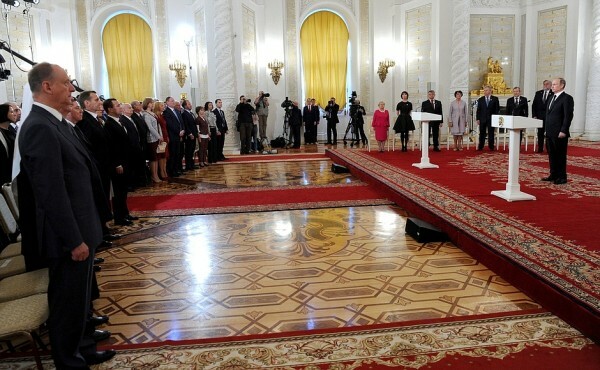 On June 12, 2015, the Day of Russia, the Russian Federation state awards ceremony took place in the St. George Hall of the Moscow Kremlin Palace. The Primate of the Russian Orthodox Church, His Holiness Patriarch Kirill of Moscow and All Russia attended. The awards given for outstanding achievements in science and technology, literature and arts, as well as humanitarian work were presented by President Vladimir Putin. After the ceremony, a grand reception took place at Ivanovskaya Square in the Kremlin. It was attended by political leaders of the country, state award winners, science and art figures and representatives of the traditional religious communities in Russia. Present at the reception, were also Metropolitan Juvenaly of Krutitsy and Kolomna, Patriarchal vicar of the diocese of Moscow, Metropolitan Varsonofy of St. Petersburg and Ladoga, chancellor of the Moscow Patriarchate, Metropolitan Hilarion of Volokolamsk, head of the Moscow Patriarchate department for external church relations, Archpriest Vsevolod Chaplin, head of the Synodal department for church-state relations, Archimandrite Tikhon (Shevkunov), executive secretary of the Patriarchal Council for culture, and Archpriest Andrey Milkin,head of the Patriarchal protocol service.